Dark Horse presents new editions of the entire Hellboy line with new covers, beginning with Seed of Destruction, the basis of director Guillermo del Toro's upcoming film. Hellboy is one of the most celebrated comics series in recent years. The ultimate artists' artist and a great storyteller whose work is in turns haunting, hilarious, and spellbinding. Mike Mignola has won numerous awards in the comics industry and beyond. When strangeness threatens to engulf the world, a strange man will come to save it. Sent to investigate a mystery with supernatural overtones, Hellboy discovers the secrets of his own origins, and his link to the Nazi occultists who promised Hitler a final solution in the form of a demonic avatar.
" Hellboy is a passport to a corner of funnybook heaven you may never want to leave. " &mdash;Alan Moore, from his introduction. Mike Mignola's fascination with ghosts and monsters began at an early age; reading Dracula at age twelve introduced him to Victorian literature and folklore, from which he has never recovered. Starting in 1982 as a bad inker for Marvel Comics, he swiftly evolved into a not-so-bad artist. By the late 1980s, he had begun to develop his own unique graphic style, with mainstream projects like Cosmic Odyssey and Batman: Gotham by Gaslight. In 1994, he published the first Hellboy series through Dark Horse. 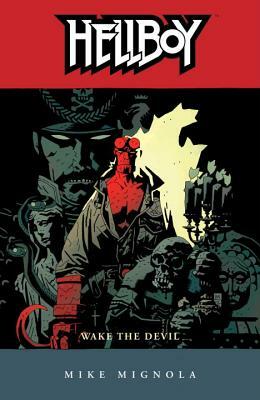 There are thirteen Hellboy graphic novels (with more on the way), several spin-off titles (B.P.R.D., Lobster Johnson, Abe Sapien, and Sir Edward Grey: Witchfinder), prose books, animated films, and two live-action films starring Ron Perlman. Along the way he worked on Francis Ford Coppola's film Bram Stoker's Dracula (1992), was a production designer for Disney's Atlantis: The Lost Empire (2001), and was the visual consultant to director Guillermo del Toro on Blade II (2002), Hellboy (2004), and Hellboy II: The Golden Army (2008). Mike's books have earned numerous awards and are published in a great many countries. Mike lives in Southern California with his wife, daughter, and cat. Pat Brosseau is a comic book letterer from Pasadena, California. He has worked on titles including Aquaman and Suicide Squad. James Sinclair is a comic book artist and illustrator known for his work on The Flash, Hell Blazer, Green Arrow, Hellboy, The Mask, and many other titles.